General view of City Churches. 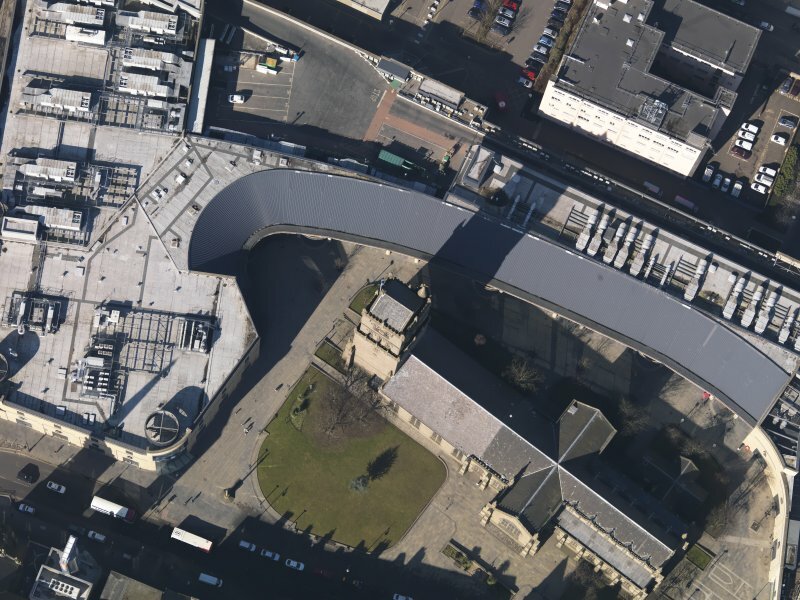 Oblique aerial view centred on shopping centret, taken from the SSE. Oblique aerial view centred on the church, taken from the SW.
Oblique aerial view centred on the churches and adjacent construction, taken from the ESE. 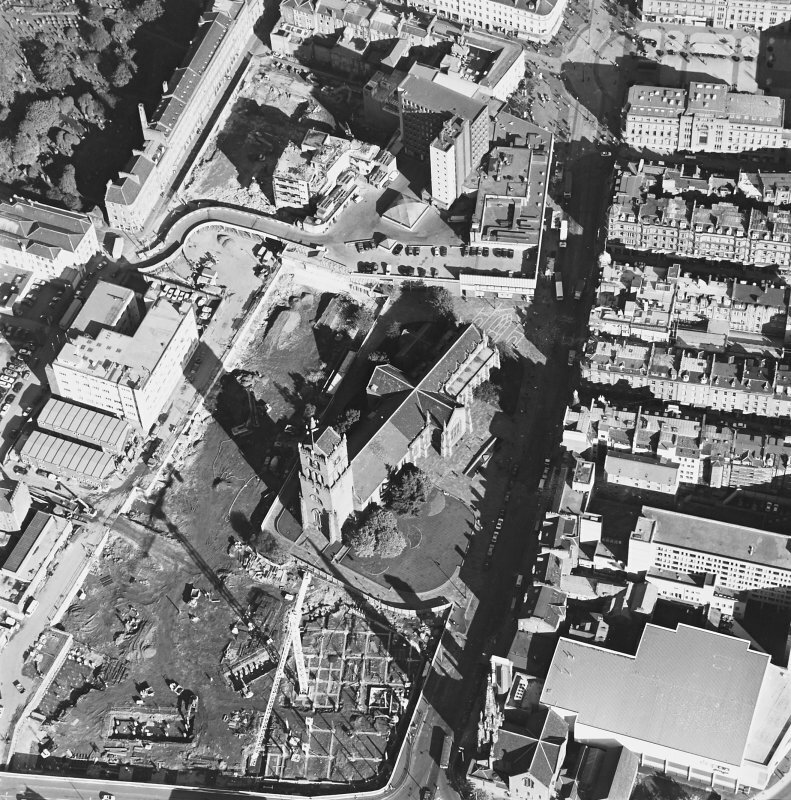 Oblique aerial view centred on the churches and adjacent construction, taken from the SE. 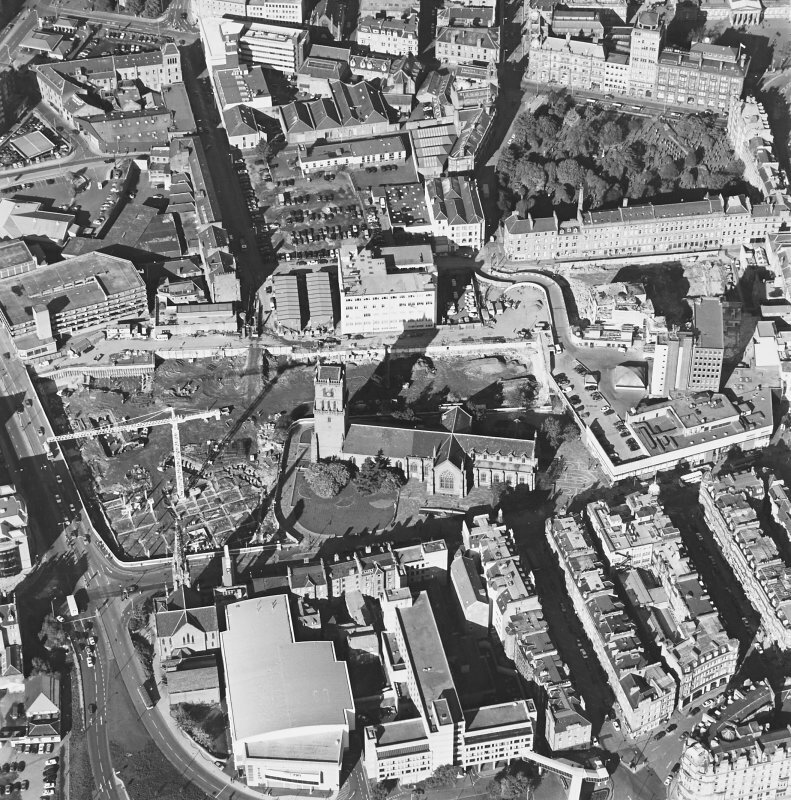 Oblique aerial view centred on the churches and adjacent construction, taken from the S.
Drawing showing masons' marks from the tower of St Mary's Church, Dundee. 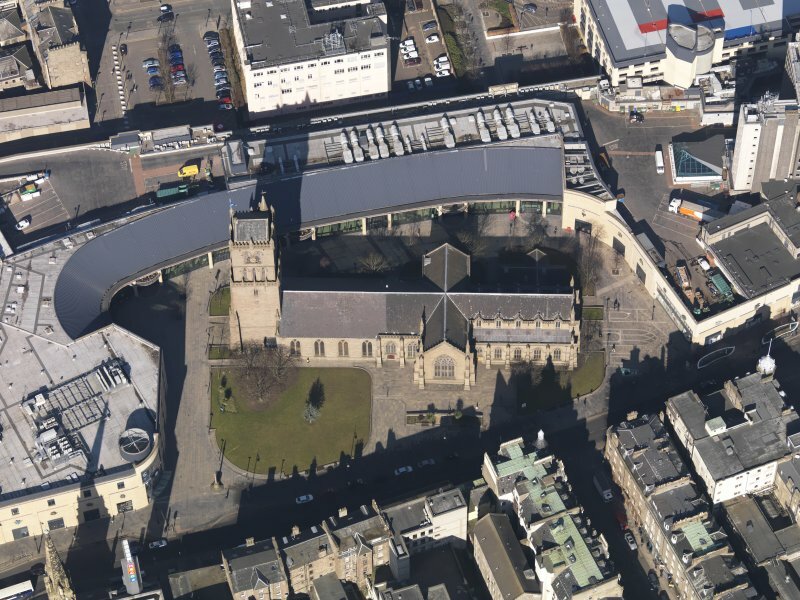 Oblique aerial view centred on the church, taken from the SSE. 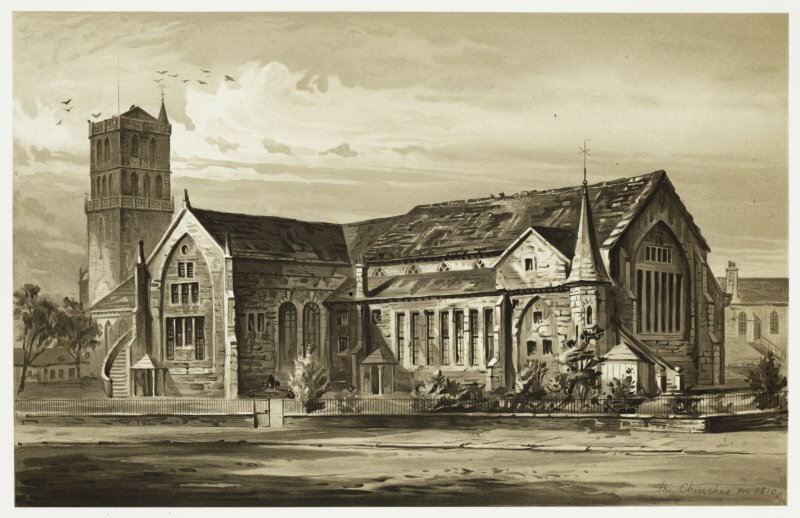 General view including St Mary's Hall. 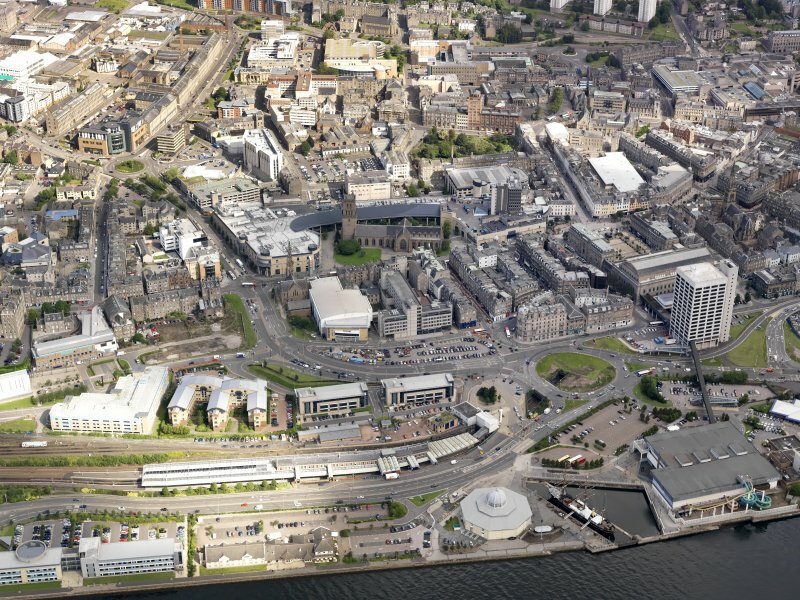 General oblique aerial view of Dundee, centred on the harbour and Discovery Point, taken from the SE. 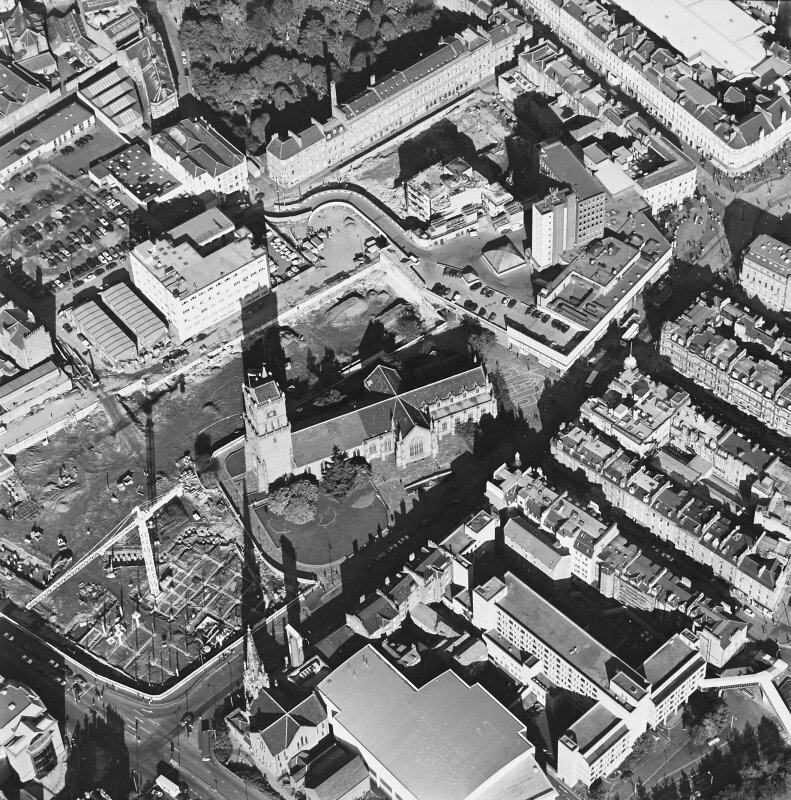 Oblique aerial view centred on the churches and adjacent construction, taken from the SW.
Oblique aerial view centred on the church, taken from the WSW. This heavily restored mid-15th century tower is all that remains of the medieval parish church of St Mary, founded about 1198. Three modern parish churches occupy the site of the nave and choir and the tower now forms a vestibule to the westernmost of these, St Clement's. Sculptured stones and cross-slabs - "memorials of Dundee prior to its historic period" (Warden 1880-5) - were found during the digging of the foundation of the East Church in 1841, and were in the churchyard in 1880. A J Warden 1880-5; D MacGibbon and T Ross 1896-7; J Stuart 1867. The 15th century steeple, heavily restored, is in excellent condition. No sculptured stones were located. NO 401 301 In November 2000 a watching brief was undertaken on a sewer pipe trench located on the S side of the Steeple Church (NMRS NO43SW 40.00). The remains of two mortar-bonded walls were recorded running across the trench N-S, and a quantity of disarticulated human bone was recovered from the subsoil. It was concluded that the pipe trench had cut into the upper layer of the medieval burial ground which lies below about 0.3m of turf and topsoil. The human remains were reinterred and further work was not required. Architect: See under john Mylne 1643 in architect's file. 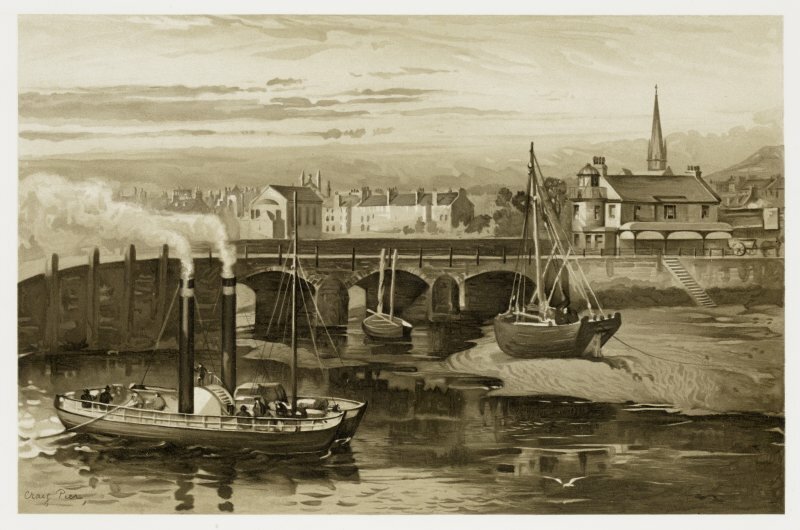 Restored 1872 by Sir G G Scott. 1989 exterior and many interior views. 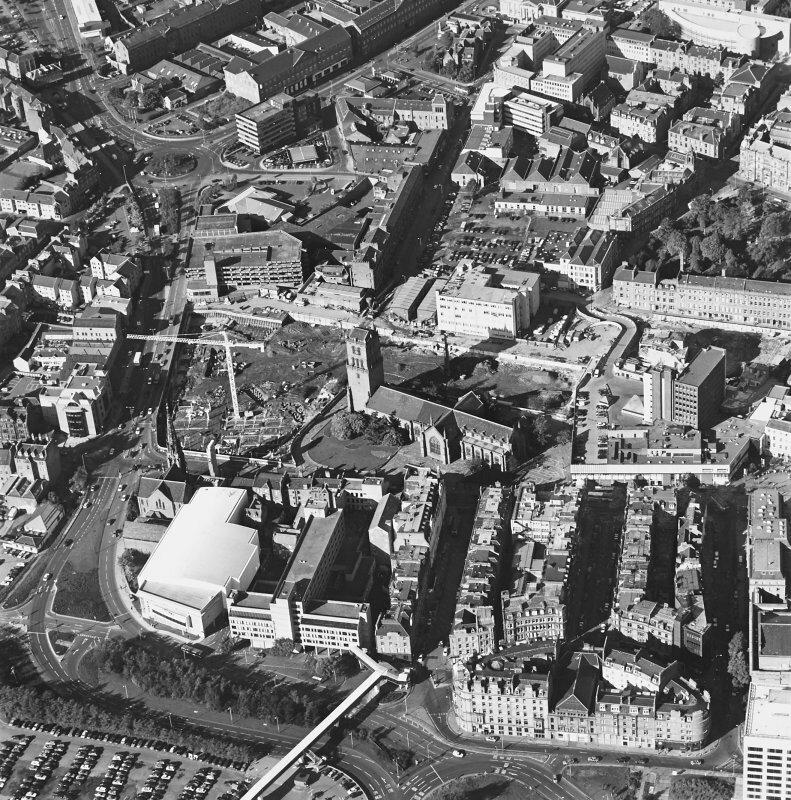 Dundee District Council Archives and Records Centre. 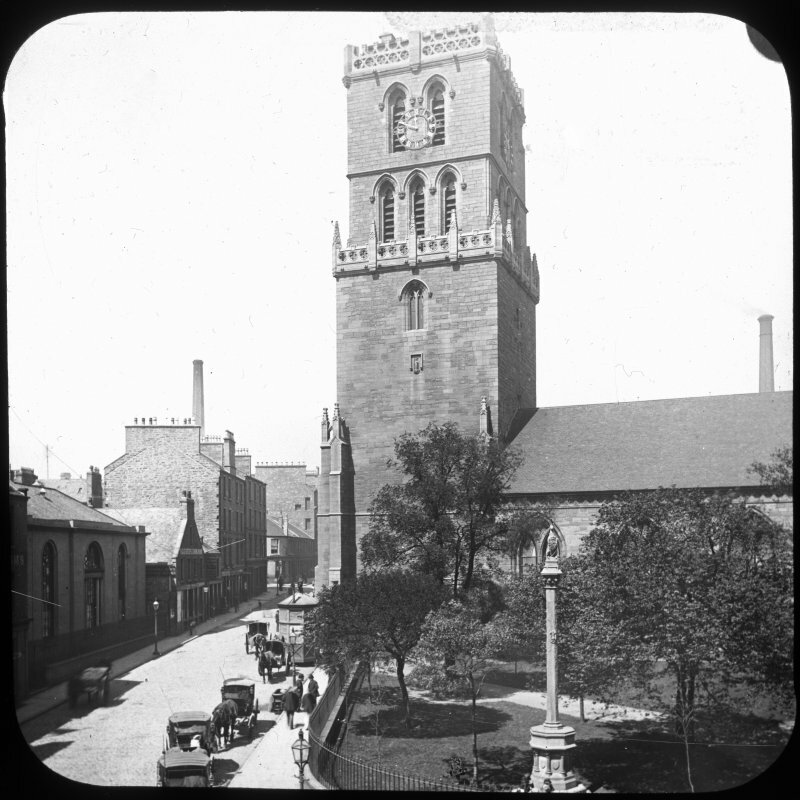 230/1 Report by George Gilbert Scott as to St Mary's Church Tower, 24 Aug. 1870. 230/2 Old Steeple; general conditions and specifications of works to be done in the restoration of floors, 1872. 230/3 General specifications of works required to be done in the restoration of the Tower c. 1871. 230/4 Schedule of prices for work proposed to be one in the restoration of the Tower, Alex Duncan, 1871. 230/5 Offer by Rob Laing, builder, for masonwork for restoration, June 1871. 230/6 R.I.B.A. 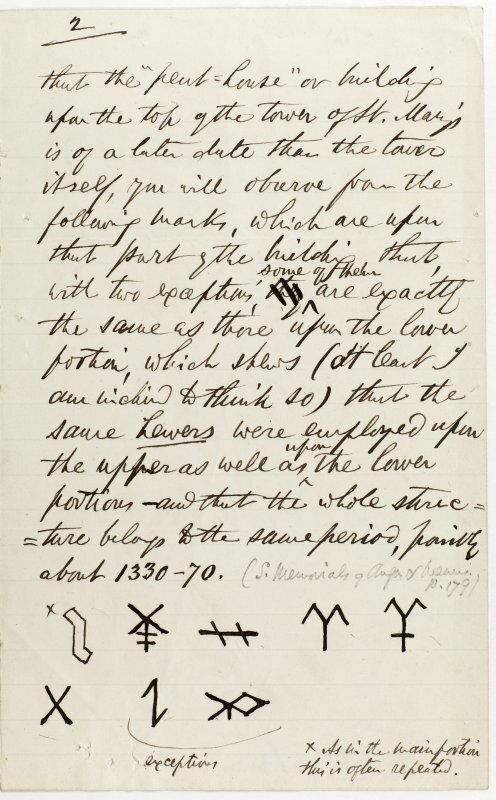 Advice to promoters and hints to workmen on the conservation of ancient monuments (printed), 1865. 230/8 Report by R Matheson, Esq. on Old Steeple, 25 Oct, 1853. 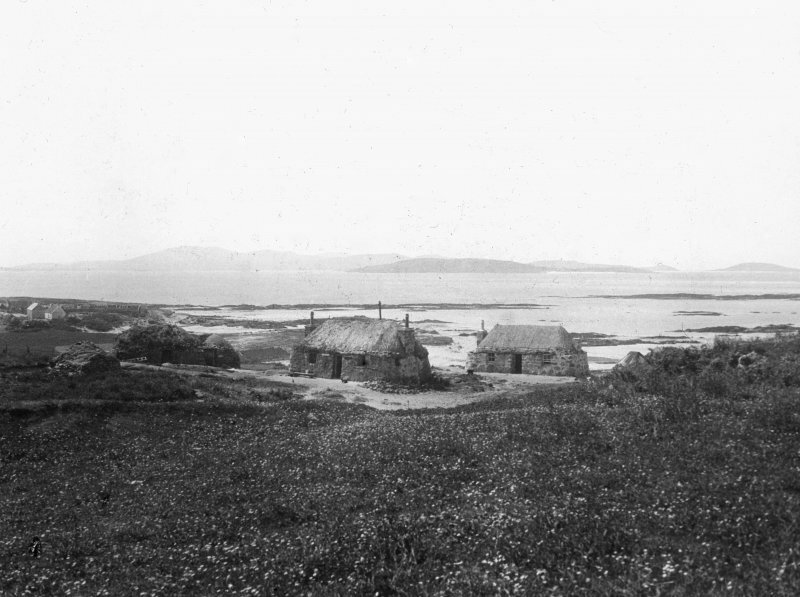 (copy dated 28 June 1870). 230/9 Ground plans and elevations of Old Steeple, nos 1-3 c. 1871 10 feet to 1 inch: ink and watercolour on linen. 230/10 Old Steeple scaffolding, contract between Provost Yeaman and Rob Lickley, 1871. 230/11 Specifications for erecting scaffolding, 1871. 230/12 Offer by geo. 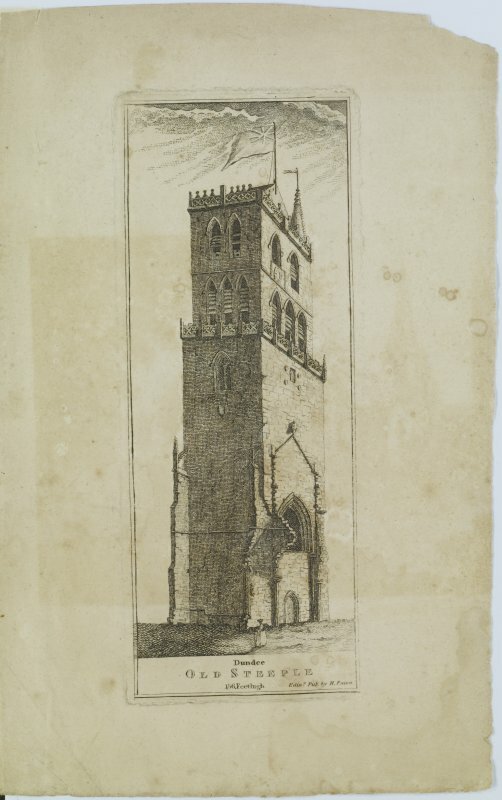 haggart for restoration of Old Steeple, July 1871. 230/13 Schedule of prices for work proposed to be done in the restoration of the Tower, Sturrock and Sherriff, 1871. 230/14 Statement of work measured with Mr Sherriff, 23 Oct 1871 to 6 May 1872. 1/2 inch to 1 foot ink and watercolour on paper. Skeletal remains found in the 19th century were regarded as victims of Monck's assault. These had been found when the buildings on the south side were cleared away early in the 19th century to widen Nethergate (here called Ladygate). The skeletons were discovered in 1814 when houses south of church grounds were removed. Skeletal remains found in the 19th century were regarded as the victims of Monck's assault. 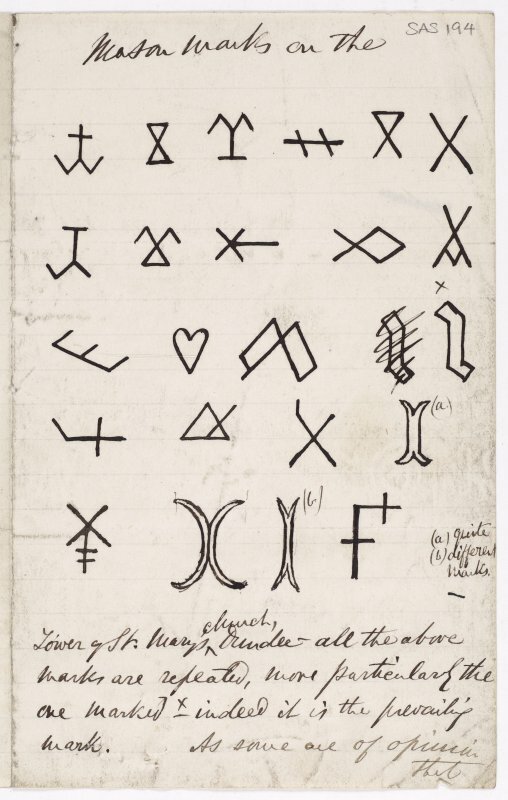 These had been found… under the floor of the Steeple Church about 1884. Also, when the tower was restored, skeletons found closely packed at base beneath thin earth cover. 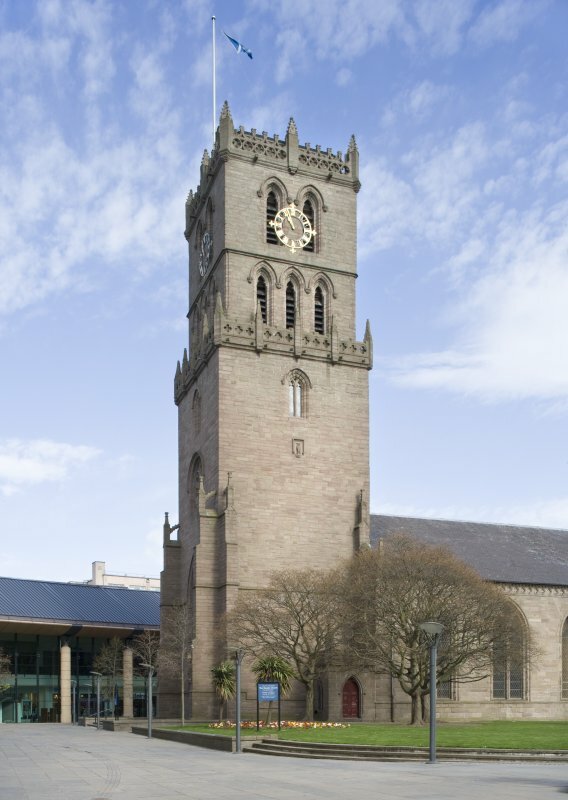 The earliest surviving masonry is incorporated in the 15th-century west tower. 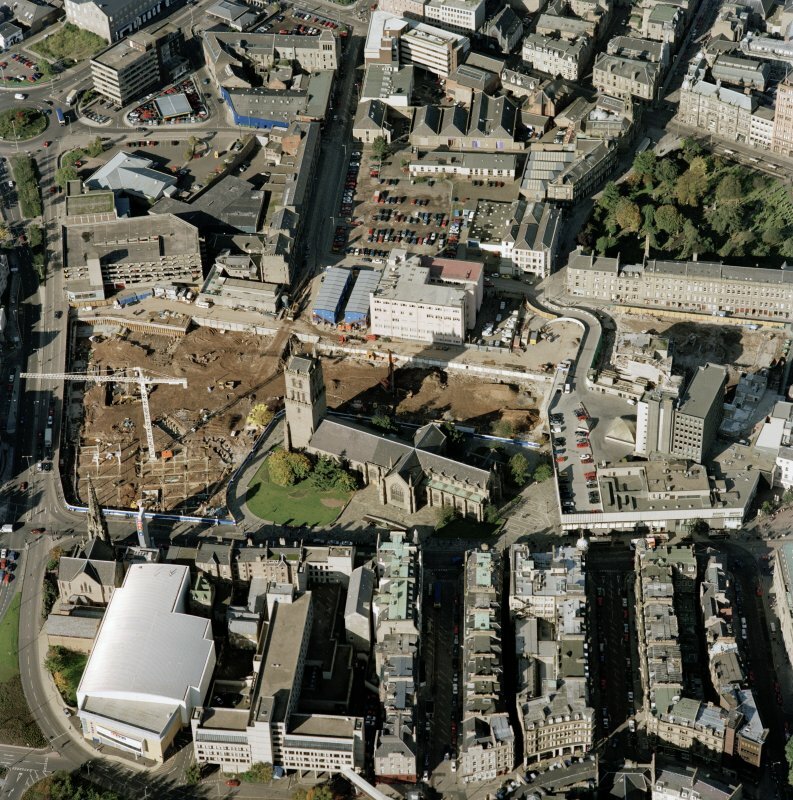 The present church has remained unaffected by redevelopment of the adjacent Overgate; the kirkyard, on the other hand, has been almost totally obliterated, surviving only in revetted portions on the north and south of the church, and standing above the level of the adjacent Overgate, Kirk Stile and Nethergate. 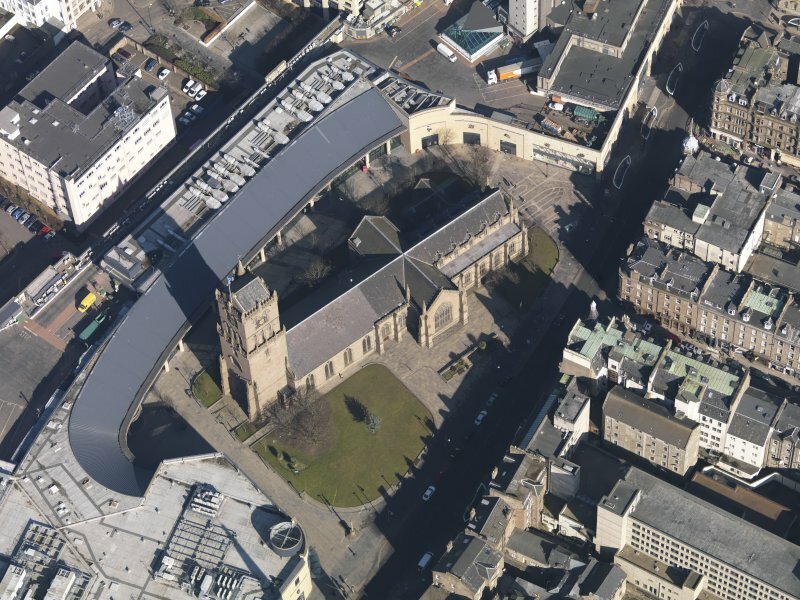 The improvements carried out in these areas have necessitated the re-grading of the kirkyard to produce the present configuration. 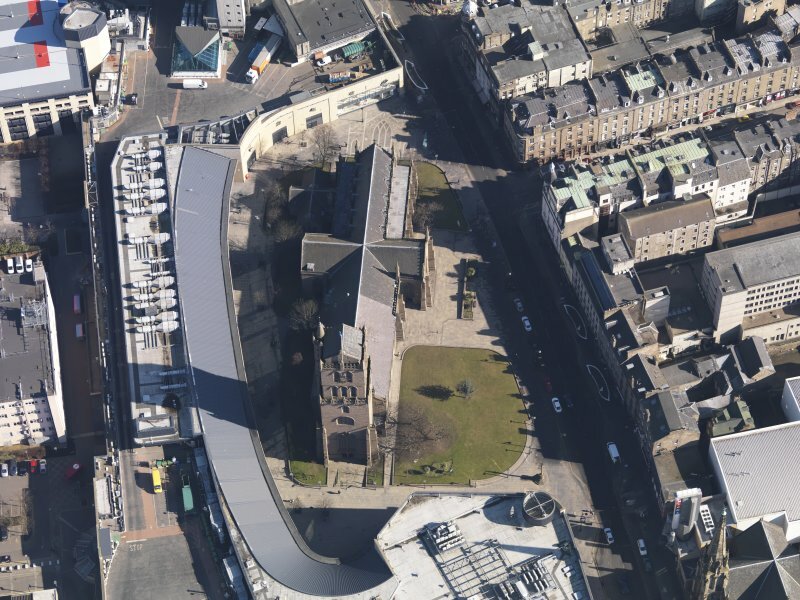 The kirkyard of St Mary was never used as a burial-ground. The use of the ground as a tip in the 16th century may mean that midden deposits survived. The residue of the kirkyard, which appears to survive only as security for the foundations of the church, now stands some feet above the surrounding precinct and may contain midden material and masonry associated with the various phases of destruction. Any future work involving disturbance of these deposits could be usefully monitored. The body of the present church is probably archaeologically disturbed. The north transept was specifically used as a burial-place. 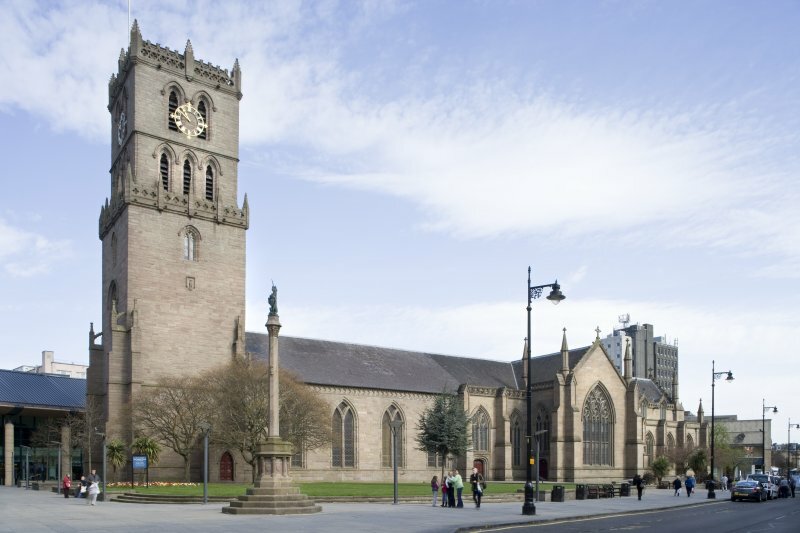 In 1633, the council found 'in times bygane there hes been great abuses be breaking of the floor of the north aisle of the west kirk for burials, and in not paviamenting the same in due season...' (Maxwell, 1884, 254). Some disturbance of earlier levels, if they survive, has therefore probably occurred. 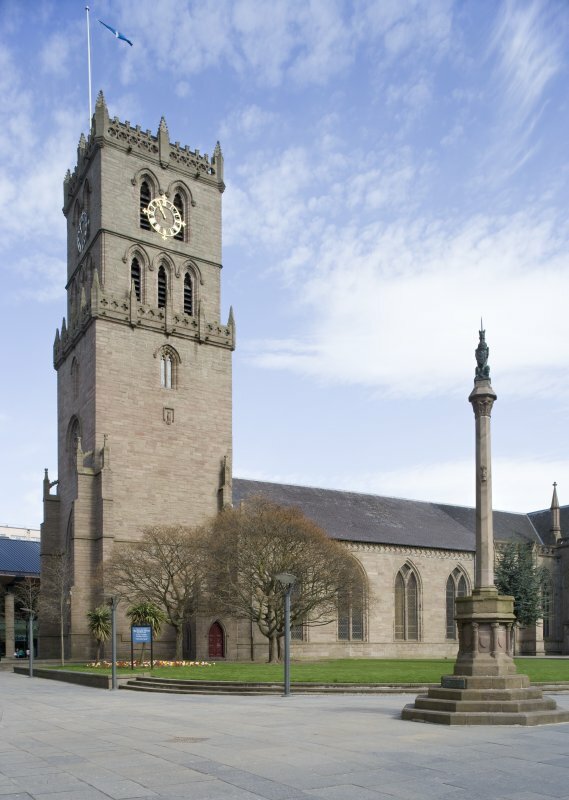 In 1814, human remains were discovered beneath the floor of the Steeple Church and in close proximity to the tower. These others are most probably related to the massacre of 1651. Future work beneath present the floor-level may provide evidence of earlier structural phases. 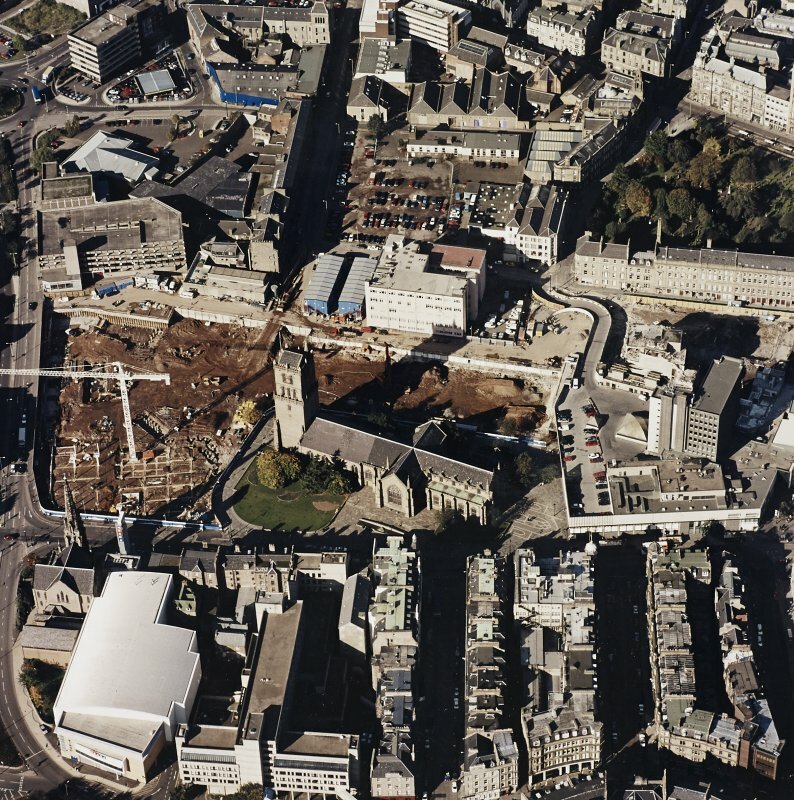 Excavation and a watching brief in 1992-3 by SUAT Ltd during environmental improvements in the area of the City Churches revealed a ditch, which had been re-cut, extending southwards from the church. It was sealed beneath a medieval graveyard from which remains of 130 skeletons were recovered, along with a large quantity of disarticulated human bone. A stone box drain for the 19th century St Mary's parish church was cut into the graveyard. The excavation produced firm evidence for a graveyard around the south and west sides of the church building, in areas once thought to have been devoid of burials. A total of 130 skeletons were excavated along with a large quantity of disarticulated human bone. Intercutting burials in each of the examined areas support the conclusion that this graveyard was used over a considerable number of years, and that there was no sign of a mass grave from General Monck's massacre in 1651. All ages were represented, as were both sexes. Areas of greater and lesser density of burials were also identified, although it is difficult to tell if this represents the use of individual layers. Preservation, in general, was poor and coffins were inferred with corroded nails found with some of the burials. Generally the coffins seem to be late in the burial sequence, perhaps indicating a change in burial practice during the use of the cemetery. Dating the cemetery accurately is difficult, but it is apparently disused by the time that a stone culvert is inserted. This culvert was certainly present by 1841, as it was used for drainage by the architects of the 19th century rebuilding of the chancel and transepts. An earlier date for this drain is possible, as a similar one was encountered during construction south of the late 18th century nave. The presence of burials cut by the steeple also indicates that at least one part of the cemetery had come in and gone out of use by the end of the 15th century. This agrees with the pottery recovered from sealed graves, which is 12th to 15th century in date. The earliest date for burial is also in doubt. The only feature predating the graveyard has no dating evidence in it, and the historical evidence is sparse. This early ditch, with its possible gravel bank, may have formed part of the early town defences, and would almost certainly had predated the founding of the building that currently crosses its projected line. If projected southwards, it would have given shelter to Spalding's Wynd, which was formerly known as Abbot's Wynd. As such, its use as a town defence prior to Earl David's founding of a church in the late 12th century is not unreasonable. Further work in the Nethergate area will be needed to provide a more substantial answer. As for the survival of archaeological deposits around the remainder of the church precinct, the results of watching briefs were poor. 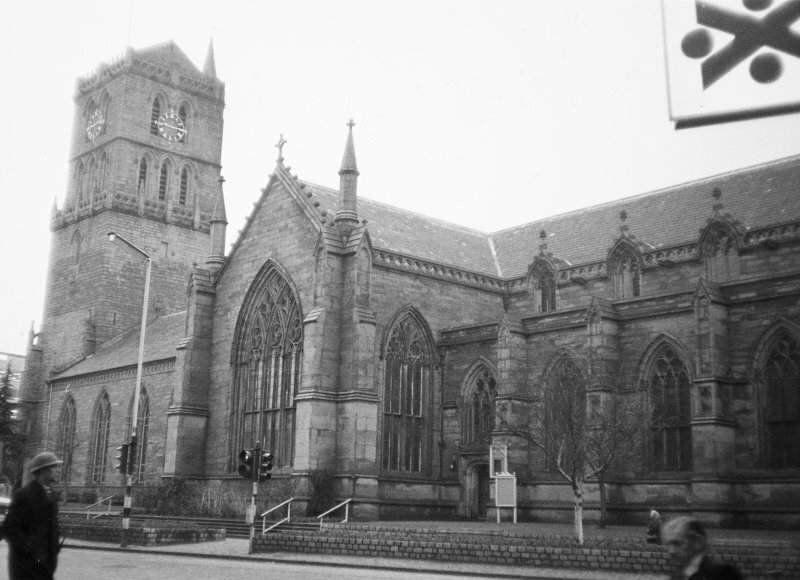 The pipe trench running down the west side of the church produced nothing but natural gravel and brick basements from the former South Lindsey St.
Excavation undertaken by the Scottish Urban Archaeology Trust (SUAT) at The City Churches, Dundee. During a watching brief by SUAT Ltd on a service trench on the south side of St Mary's Tower in 2000, three north-south aligned walls were noted, and some disarticulated human bones were disturbed. Two of the walls were probably former boundaries around the church dating to the 19th century and the 1960's. The bones were reburied on site. 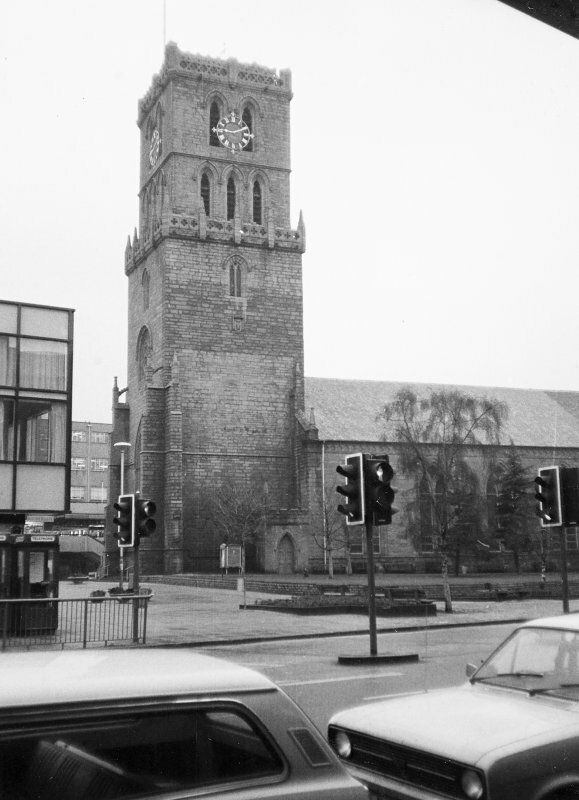 The excavation for the required sewer pipe ran along the south side of the steeple 6.25m out from the steeple's south wall. The excavated trench was 16.40m in length, a maximum of 0.90m deep and 0.25m wide at the base. It sloped down to thes west and ran from a trap in the pathway beside the church to the west boundary retaining wall. At the east end of the trench were large fragments of mortared stonework that had been removed to accommodate the pipe trench. These remains were considered to be of a wall. At 8.60m from the east end of the trench were the remains of another wall, 0.50m wide and visible to a height of 0.30m. At 12.1m from the east end of the trench, a third wall was found measuring 0.45m high and 0.40m wide and which was not bottomed. All the walls were aligned north to south. The function of the eastern most wall is uncertain, it may have been part of the 19th century landscaping and rebuilding work undertaken after a disastrous fire in 1841 destroyed the church. 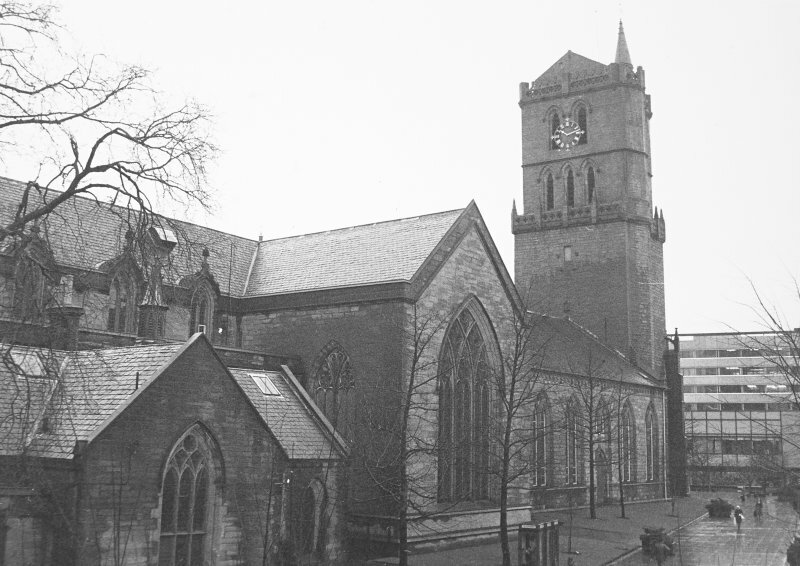 The middle wall is considered to be the revetting wall around the south side of the church on the east side of School Wynd as shown on the first edition ordnance survey map (1860's) which remained in place until the 1960's when the first Overgate shoppiung centre was built. The western most wall in the trench was the revetting wall built for the 1960's Overgate Centre. The west end of the trench was very close to the latest revetting wall built for the 2nd Overgate shopping centre which opened in 2000. In section the stratigraphy revealed by the trench cut consisted of 0.30m turf and topsoil over raised beach gravel deposits. The gravel deposits at the bottom of the trench contained abundant disarticulated human bone indicating that the disturbed upper level of the medieval burial ground had been reached. The fragments of human bones were re-interred in the trench.